We planned to spend three nights in New Orleans as part of our trip, however due to recent flooding and a severe weather warning, we missed our first evening and stayed at a motel a few hours drive away. Still, we were lucky enough to spend both Friday and Saturday night in this great city. I don’t quite know what I expected from New Orleans, I think I possibly expected it to be similar to Nashville, but it is in fact very different. It’s very culturally diverse and has a relaxed, hippy vibe to the city. There is music and dancing around every corner, beers and other alcoholic beverages can be drunk on the streets and there are hundreds of quirky little shops to browse (or cool off from the heat!). There is also some great local speciality food. Beignet’s are delicious little donut’s that are typically eaten for breakfast. There is a beautiful little cafe in City Park called Morning Call, which is a super relaxed place to eat these for breakfast. . In the evening, gumbo and jambalaya are typical main dishes and both are delicious. And of course, there’s an abundance of delicious sea food! However, for us, the star of the food show was the muffuletta. Muffuletta originated in Central Grocery and Deli, so that’s where we went! A delicious, sesame seed sandwich, filled with cheese, deli meats and olives. Heaven! Order a half between two and get extra if needed, they’re very filling. We spent the best part of the two days and nights listening to a whole host of excellent music. Bourbon street is infamous and on the outskirts it sounds like a great, fun place to drink. In actual fact, it’s the USA’s version of the Magaluf strip and we decided to avoid this. We did however find another street, which we much preferred; Frenchmans street. 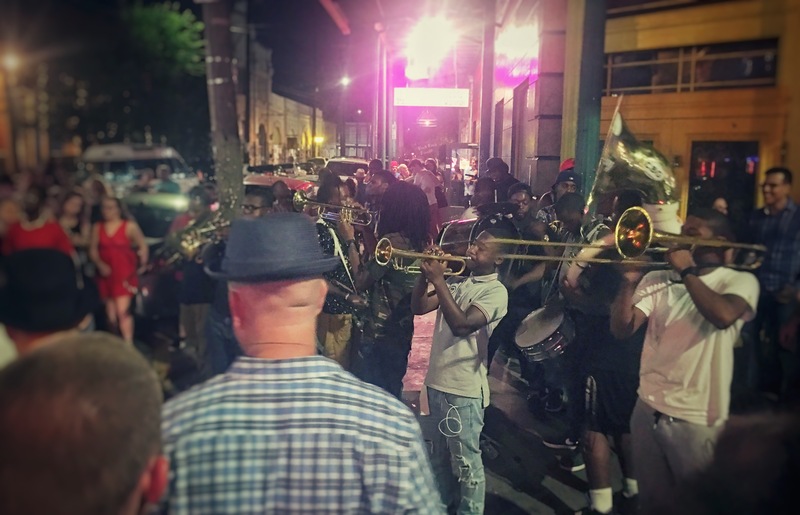 Filled with little bars and restaurants pouring out sweet jazz symphonies their doorways, Frenchman street is definitely the place to go for a more authentic experience. 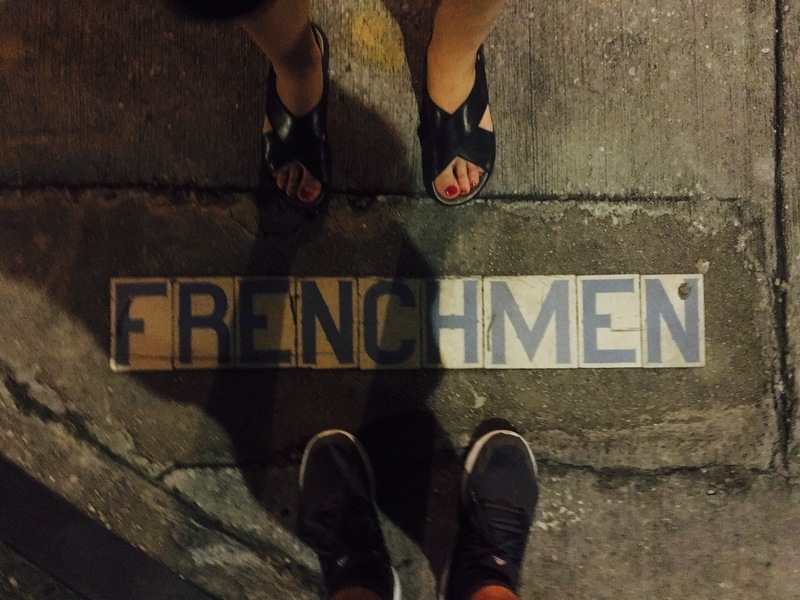 As I love to make lists, here are my three favourite bars to drink in on Frenchmans Street. 3) 80/20: This place has a great selection of beers and the music seemed to be constantly playing. There were a lot of excellent, talented artists in there. 2) Three Muses: A bar well renowned for its music and yet also serves the most delicious food. Food is American style with an Asian twist and the fries are divine! There’s a distinctly classy vibe to the Three Muses and the majority of people are enjoying the music over dinner and a glass of wine. Whilst we were there we listened to two fantastic female acts playing beautiful, soulful music. 1) Finally, the Spotted Cat was our favourite bar. We visited both in the daytime and in the evening and both times was fantastic. A tiny little bar with great atmosphere, reasonably priced beers and the best of all the bands we saw. Not to be missed! From New Orleans, we decided to move away from the city for a couple of days to explore New Mexico and the Grand Canyon. Posts to follow!